In front of what Computer History Museum president John Hollar called "the largest crowd for a Revolutionaries lecture" that he's ever seen, IBM Watson principle investigator Dave Ferrucci sat with Financial Times' Richard Waters on November 15th for a conversation about "A Computer Called Watson." To the audience of about 450 Silicon Valley techies, influencers, teenagers and inspired engineers, Dave kicked off the conversation by explaining how Watson came about; and it began with the notion of natural language processing, namely, contextual aspects of language. "At our house, I'd always call the kids down to see something 'interesting' that I'd done - some type of experiment or science-related thing," Dave said. "After enough of these demonstrations, my daughter started to associate the word 'interesting' with 'boring' - so there's a little about language context." It turns out Dave was headed toward a career in medicine and was pursuing an M.D. rather than a Ph.D. But the biology major quickly developed a fascination with artificial intelligence, and a passion for programming. "I thought it was incredible that you could tell the computer what to do - and that it would do it," he said. After obtaining his BS in biology from Manhattan College, he pursued computer science with an emphasis in knowledge representation and reasoning at Renesslaer Polytechnic Institute, completing his Ph.D. in 1994. 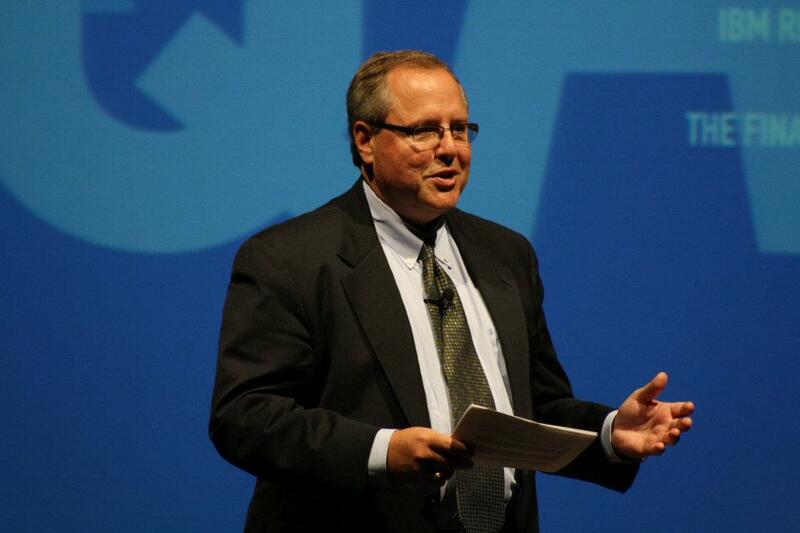 Since joining IBM in 1995, Dave has contributed largely to the Research function as a computer scientist. But in 2007, when IBM executive Charles Lickel challenged Dave and his team to revolutionize Deep QA and put an IBM computer against Jeopardy! 's human champions, he was off to the races. "I had to get funding," Dave explains. "I told the executives I could do this in 3-5 years. I kind of just guessed." The executives bought it, and Dave had a huge task ahead. By assembling a team of eventually 28 researchers in the areas of natural language processing, software architecture, information retrieval, machine learning and knowledge representation and reasoning, Dave created Watson - a computer system, that, using a combination of sophisticated hardware and software, could understand natural language and deliver a single, precise answer with confidence and evidence for its decision. At the end of the conversation, Dave told the crowd about Watson's new job in the medical field: "We want Watson to enable better judgement by humans in decision-making, whether it be in medicine, law, finance or services," Dave said. "While the human is the ultimate decision-maker, Watson will provide evidence and confidence by scouring millions of sources of related information in a short amount of time." In an exhibition Jeopardy! game following the talk, IBM's Eric Brown was the ultimate Alex Trebek, hosting players GigaOm's Stacey Higginbotham, Sierra Ventures' Robert Walker, and "oh yeah, our third contestant, Watson, from Yorktown Heights, New York, built by a couple of computer scientists," an introduction met with laughter that would continue throughout the game. The animated human contestants instantly won over the crowd after trailing Watson through the first part of the game. In fact, when Stacey buzzed in with the first correct question for the humans, the crowd went wild. 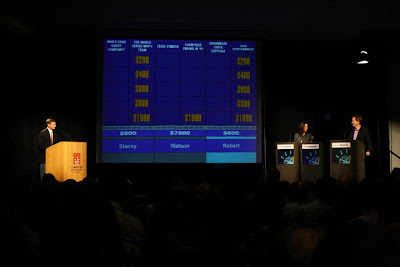 The night continued in that way, and the human contestants even found themselves getting answers from the crowd, to which host Eric Brown responded: "Watson can't hear you, so humans have an advantage!" As it turned out, the trick was buzzing in before Watson - hard to do unless you're a seasoned Jeopardy! vet like Ken Jennings or Brad Rutter. As the exciting match wound down, and all three contestants answered the Final Jeopardy! 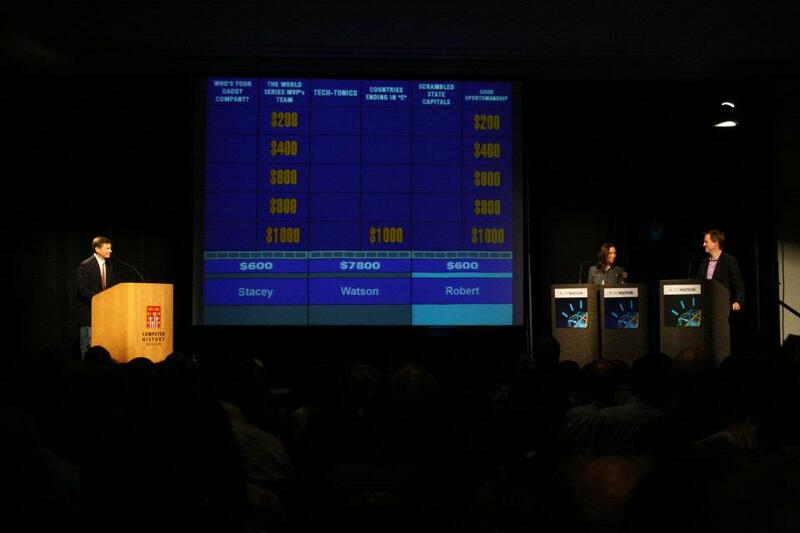 question correctly, Watson came away with the win, but left the auditorium with tremendous enthusiasm for this computer and its impact on the future of technology. This post originally appeared at ibmresearchalmaden.blogspot.com on Friday, November 18, 2011.